This was the parlour of the house and its exuberant classical ornament is typical of the period. Originally the room had two windows overlooking a garden, to the right of the chimney-piece, and a doorway opposite the chimney-piece, which led into a passage. The panelling is divided by six Doric pilasters, or rectangular columns. These and the frieze that encircles the room at ceiling height are decorated with strapwork ornament. The elaborate overmantel contains a variety of carved decoration. The four caryatids (pillars in the form of women) derive from a series of engravings entitled Caryatidae by the Netherlandish designer Hans Vredeman de Vries (1527-?1606). Below them, two figures in niches represent Peace and Plenty. At the base, a panel of strapwork ornament surmounts two pilasters. The stone chimney-piece features a frieze of carved birds and monsters, which were probably originally picked out in gold and colours. By 1750 the house was no longer a private dwelling but the 'Old Palace School'. In 1894 it was demolished. This destruction caused an outcry, led by the artist and designer C.R. Ashbee, which inaugurated the organised preservation of London's architectural history. The paneling is divided at intervals by six Doric pilasters with plain moulded bases, pedestals, and capitals, the shafts being decorated with a netted arrangement of interlacing straps, known as strap ornament, elaborately worked in low relief. At the ceiling level is a richly ornamented oak freize with strapwork panels of similar relief but of different design, separated by brackets, with a dentil moulding above, the whole being surmounted by an ogee cornice. The brackets dividing the panels and supporting the cornice are formed each of a combination of triglyph and console. They occur over every stile of the paneling and are repeated twice over the pilasters. 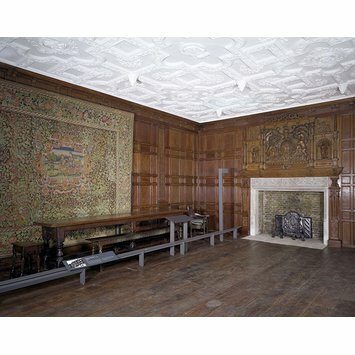 The oak overmantel has in the centre the royal arms of James I carved in very high relief. The shield is: Quaterly, 1st and 4th the arms of England and France quartered, 2nd Scotland, 3rd Ireland, encircled by the garter with the motto HONI SOIT QUI MAL Y PENSE, and supported by the lion and unicorn with elaborate mantling. Below is a shaped label with the motto DIEU ET MON DROIT, and above the shield, a crowned helmet surmounted by a lion passant gardant. The arms rest on a ledge, supported by modillions, and having in the centre a breacket in the form of a grotesque mask with an oblong pane, of scrollwork on either side. On each side of the arms is a niche carved and grooved inside and surrounded with nail-head ornament, containing figures of Peace and Plenty respectively, carved in elm and formerly gilded. Each is set in an architectural frame with base and entablature supported by carved and fluted columns. These are surmounted on the inner ends by tapering obelisks, resting on four balls, upon bases pierced with four round-headed arches. (cf Croscombe Church, Somerset; St Johns church, Leeds). On each of the inner ends of the entablature is a pair of terminal figures of grotesque female form supporting a cornice carved with three consoles and forming a framework to the coat of arms. Rising above this is a curved pediment of open strapwork and below, in he angles at either end and resting on the entablature, is a similar ornament of bracket shape. The whole ovemantel rests on a long shelf, of which the front, of quarter-round section, is carved with strapwork ornament and grotesques, and with four bosses in the form of terminal figures, male and female one below the base of each of the columns. This is supported by oak pilasters or caryatides, one of which flanks the opening of the fireplace on either end. These, in conjunction with the mantel-shelf, form a framework to the stone lining; that on the left being surmounted by a small finely-carved male bust, and that on the right by a female; while the terminal-shaped shaft of each, carved with a festoon of drapery and split baluster ornament, rests on a pedestal in the form of masonry with a moulded base. On arrival at the Museum, the fireplace was thickly covered with successive coats of paint, the removal of which revealed the richness and quality of the carving. The plaster ceiling (museum no. 51-1894), original to the room, is planned on a pattern of intersecting squares, quatrefoils, and shaped panels, with eight enriched pendants hanging from the point of intersection of the strapwork ribs; the ribs being moulded with a trailing pattern of fruit and flowers. The centres of sixe of the quatrefoils are occupied by circular medallions surmounted by wreaths and winged cherub heads, and containing full-faced bearded busts representing three of the Nine Worthies, inscribed 'IOSUE.DUX', 'HECTOR.TRO', ALEXANDER', each head being repeated twice. The remaining quatrefoil in the centre of the ceiling contains the shield of James I bearing the royal arms, as on the overmantel, but without the supporters, and surmounted with a crown on the side of which are the letters I.R. each of the shaped panels contains a conventional floral pattern of sprigs, sprays and fruit. 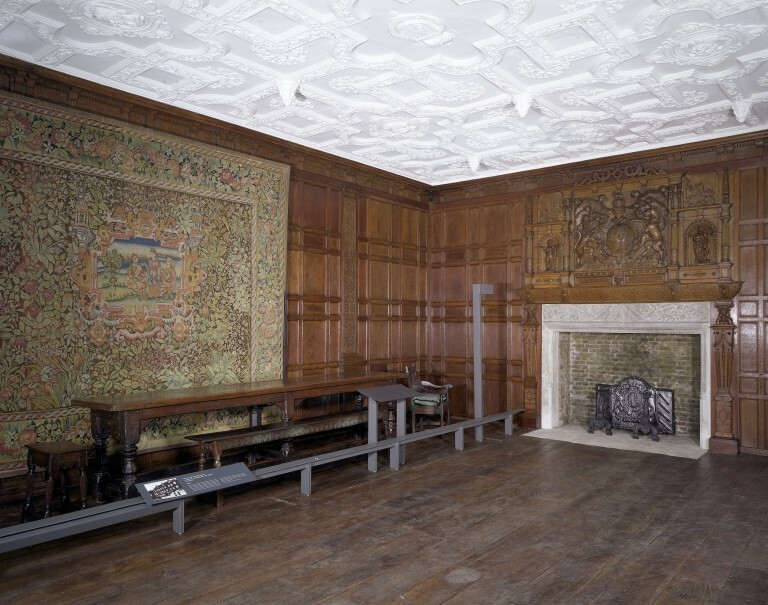 The oak floor boards displayed with the panelling since 2001 are not original to it; they are salvaged floorboards acquired c.2000 as 'dressing' for the room. Panelling bought for £75 from Mr J. Binns, 186 Brompton Road, London SW7 (RP 31061/1894 on nominal file Bromley by Bow; fireplace bought for £150 from the School Board for London, Victoria Embankment, London WC RP 36441/1894. The obelisks, and figures of Peace and Plenty on the fireplace, which had previously been taken from the room, were given to the Museum in 1901 by Miss A. Papineau, who lived in the Palace until 1869. For about a century after being divided in about 1750, the house was occupied as a boarding school, and was known as Palace House School. From 1874 until its destruction, part of the building was used as a club and part finally as a lodging house , the remainder being occupied by a firm of colour-workers, who used the 'State Room' as a store. In 1893 the School Board for London acquired the property for the purpose of erecting a school. They repurchased the mantelpiece of the 'State Room' which had been sold with the rest of the house to a firm of house-breakers, and afterwards transferred their purchase to the Museum, for which the paneling and ceiling, a stone chimney-piece from an adjoining room and an archway from the hall had already been acquired. A few plaster details from ceilings and freizes in other rooms (not specified), parts of the original oak mullioned windows, some leaded glass and some painted panels (nos. 1282-1282x-1900), were afterwards presented in 1900 by the Committee for the Survey of the Memorials of Greater London, who were influential in securing the paneled room for the Museum. At the time of demolition, the room, which was situated on the ground loor at the back of the house, was fitted with a partition, two pinewood doorways, one on either side of the fireplace, three sash-windows, and an inner marble mantel-piece (added in the 18th century). As first set up in the Museum the paneling was slightly rearranged and parts renewed. Paneling from the fourth wall between the sash windows was used to fill the space occupied by the pinewood doorways. It is more likely that the house was built as a second home by a London merchant or courtier. Bromley-by-Bow was then a pleasant country area, but easily accessible from London. The house was a substantial, four-storey building in red brick, with two projecting towers at the front and about 24 rooms. It was similar in design to other houses recorded in drawings by the surveyor John Thorpe, which date from about 1590 to 1625, but we cannot be sure who designed this house. Although it was not a large house by courtly standards, it was certainly built by someone of means and pretension. Surviving houses of this kind in London are Sutton House, Hackney and Eastbury House, Barking, both open to the public. The plaster ceiling is original and represents the best Jacobean plasterwork. Ceilings of this type were always whitewashed, rather than coloured, but were decorated with elaborate relief ornament that was cast from wooden moulds. This room, originally known as the 'State Room', was preserved when the 'Old Palace' was demolished to make way for a school. The house was erected in 1606 and, although no documentary evidence has been discovered, it is very probable that it was built as a hunting lodge for King James I who owned the Manor of Bromley, and whose arms, mottoes, crest and initials figure prominently in the decoration of this room. This oak paneling comes from the State Room of the building known as the Old Palace at Bromley-by-Bow in east London, which was demolished in 1893 to make way for a school. The building had been erected in 1606, probably as a hunting lodge for James I who owned the manor of Bromley and whose arms, mottoes and crest figure prominently in the decoration of the room.